It is somewhat hard to listen to his sermon, which seems to be teaching polytheism and which has many disconcerting particulars, and reconcile it with his post-sermon comments, which state he is a monotheist. If someone says contradictory things, which of the things that they say do you believe? I know for myself, I would want to listen to more of Comer’s sermons to determine whether he has a habit of truth obfuscation or whether he is, on average, a good teacher. 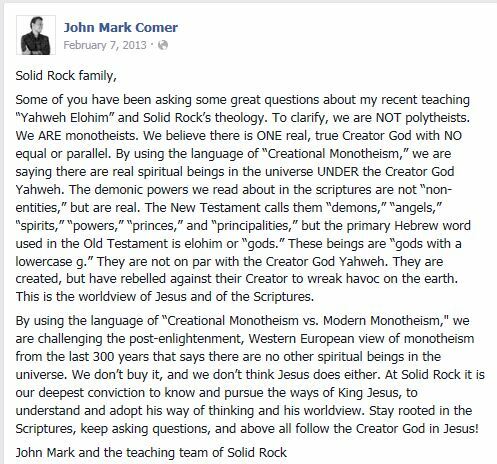 At the very least, his teaching on creational monotheism, if not a heretical discourse on polytheism, is extremely confusing and full of error. It warranted the controversy. The entire premise of the sermon is based on an equivocation of the term monotheism. Most people would assume monotheism means belief in one god. But Comer redefines contemporary monotheism as belief in one God with no belief in any other spiritual beings. And then he teaches creational monotheism in response to his audience’s lack of belief in spiritual beings other than God. To all the monotheists who teach creational monotheism, please throw away the doctrine and quit causing strife.